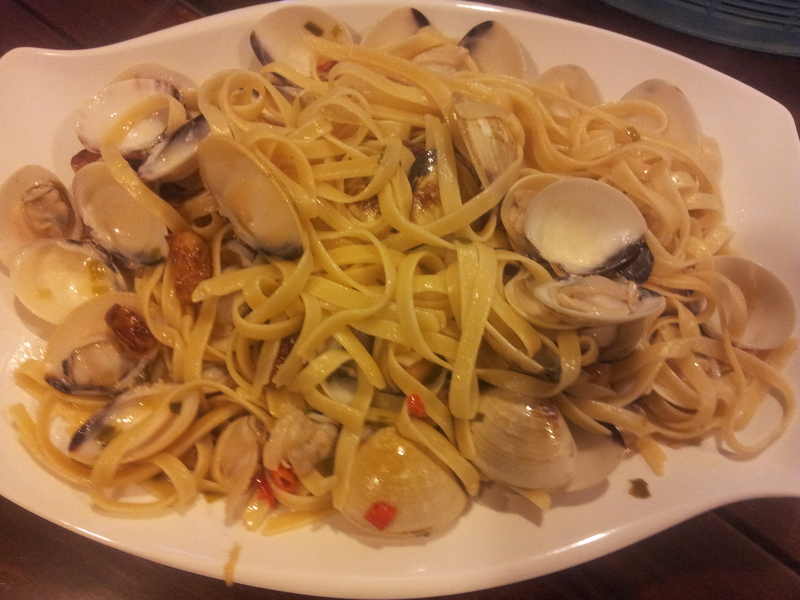 There’s only my eldest daughter Su Min at home for dinner, so I cooked just enough vongole fettucine for 2 of us, PLUS trying out a grilled sotong (squid) recipe. My preferred pasta is spaghetti but since there is an opened yet unfinished packet of fettucine, I used that instead. I did the usual browning of peeled garlic cloves in olive oil over low fire and soaked in the aroma. I then emptied the olive oil & browned garlic into a bowl. I added some salt & oil to water in a sauce pan and bring it to boil and put a bunch of (say 200g) fettucine in the boiling water for 11 minutes according to the timing instructions. I tested the texture to make sure it is just al dente & transferred the fettucine to a colander & set aside. In the pan still greased with olive oil I added 15g butter & threw in cut chilli padi & cut spring onions (green onions). I transferred the bowl of olive oil with browned garlic back into the pan. I then turned the fire high & put in the clams. Next I added 1.5 cups of white wine & 1 teaspoon sugar, cover the pan & let it reduced for few minutes. The clams opened up when cooked. I added the fettucine, turned off the fire, tossed and added sea salt to taste. The shellfish broth, sweetness of the white wine, fragrance of garlic & olive oil, & the spicy kick from the chilli padi all combined very nicely to make this a very tasty dish. Prepare the pasta – add salt & oil to water in a saucepan & bring to boil. add fettucine and boil according to timing instructions. test to make sure the pasta is just al dente & empty into colander & set aside. Cook the vongole pasta – brown whole bulb of peeled garlic cloves in olive oil in a pan over low heat. empty oil & garlic into a bowl. add butter to the pan & throw in cut spring onions & cut chilli padi. add the clams, turn up the fire, add the white wine & sugar, cover while the clams cook. The clams will open up when cooked. add in the fettucine, turn off the fire, toss & add sea salt to taste. serve. 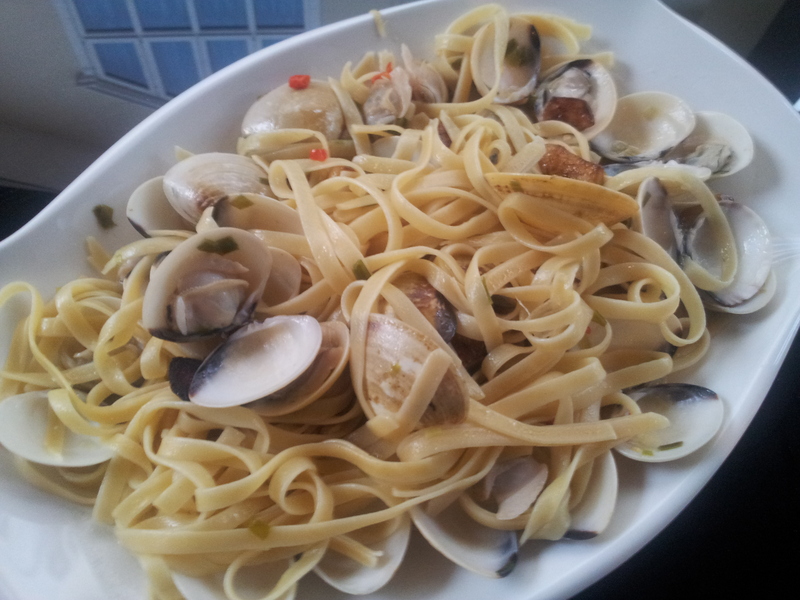 This entry was posted in Recipes and tagged clams, fettucine, pasta, shellfish, vongole. Bookmark the permalink.